Airport Honolulu Hotel offers excellent facilities and guest accommodations to host a business meeting or event near Honolulu International Airport. 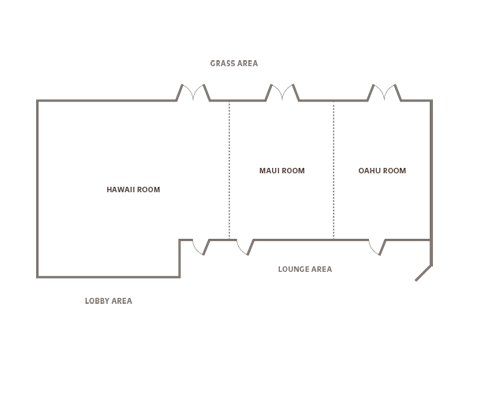 The flexible Hawaii Ballroom divides into three meeting rooms adjoining the lobby and lounge area. Joint Base Pearl Harbor-Hickam, Tripler Army Medical Center, Fort Shafter, and USPACOM headquarters are within a few minutes drive. It is 5 miles from the Downtown Honolulu business district and 8 miles from Waikiki.The hotel is easily accessed via H1 Freeway or Nimitz Highway. Hawaii Ballroom's seats 200 for banquets. Its 2,166 square feet divides into 3 meeting rooms.